Rock, Paper, Scissors, Writer’s Notebook! There are some sure-fire things that spark creativity in a classroom. And no it’s not always a computer! I say this despite the fact that my class is a computer lab, so bear with me. I keep magnets of all shapes and sizes handy, as it is easy to start a conversation about science with a lump of metal. I also have a box of weird-looking rocks that look like they belong to a Martian landscape. 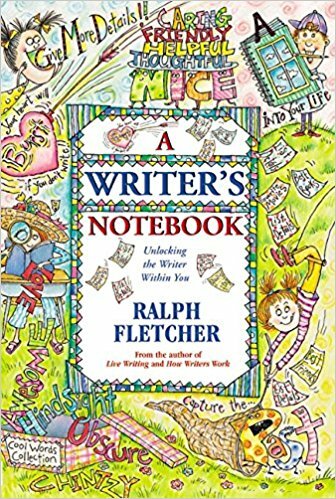 A few weeks back our reading specialist gave me a book called A Writer’s Notebook by Ralph Fletcher. It seems pretty obvious, that every would-be writer should jot down thoughts and ideas he or she stumbles upon. The book encourages students to consider taking ‘notes’ in different ways: “Seed ideas,” “Mind pictures,” “Digging out crystals” and “Snatches of talk” among others. Writing is a lot like that. Anything can spark an idea, but one must painstakingly mine it to let the words tumble out.